Venturi Mixer Safety Package includes flame supervision, smart redundant safety shutoff valves, and temperature display for garages, assembled with 1/2″ inlet, installed and tested. More commonly known as venturi mixers, these mixers use the gas flow through the orifice to entrain the air required for combustion. They can be used with low or high pressure natural gas or propane. Because propane requires 2.5 times the amount of air that natural gas requires to burn completely and efficiently, the propane mixers feature an additional sleeve, which aids in the entrainment of air. 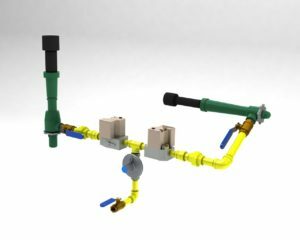 We commonly use injectors on garages and pipe warmers.